I was feeling a little under the weather on Sunday. Ross and Logan went to the the deer lease and by the time they got home on Sunday I was already in my PJs and didn't feel up to taking blog pictures. So, instead of seeing full outfit photos, I decided to put together an Instagram "outfit of the day" recreate. I used to do these once a week, back in the day. I am contemplating about bringing them back. What do y'all think? I wore this outfit on Saturday evening. The temps finally turned cooler and got down into the 40s. I couldn't resist the opportunity of the weather shift and to throw on my plaid blanket scarf I got at Zara last year. I was excited to find an almost identical one for you guys. In addition to the excitement of cooler weather, I also am pumped to share an amazing chance to win a $300 gift card to Nordstrom! The Nordstrom Half-Yearly Sale is rapidly approaching, November 5th to be exact. I have teamed up with seven other ladies to give one lucky reader a $300 Nordstrom Gift Card. The Half-Yearly Sale is the perfect chance to stock up on your winter wardrobe, fun accessories or holiday gifts. P.S. I hope everyone had a happy Halloween. The candy we got from trick or treating was obscene. We plan on passing most of it onto a friend who ships extra candy to our U.S. soldiers. Here's a peek at our costumes. We had the best time and the weather was absolutely perfect! Bring on November and all the upcoming holiday hoopla. Thats a lovely scarf, fabulous colours. I totally am loving your plaid scarf, the colors are perfect! Love it!! I just kicked off the month with a giveaway too! I like the idea of recreating your instagram look. Cute one too! I hope you are feeling better! Love, love, love the red lipstick! It looks great on you. I would seriously pee my pants if I won this giveaway. I need it. You look fab as always my love. Hope you're feeling better! I can't believe November 5th is this week. Holy goodness where did this year go?!?!?! Hope you feel better soon, Shanna! 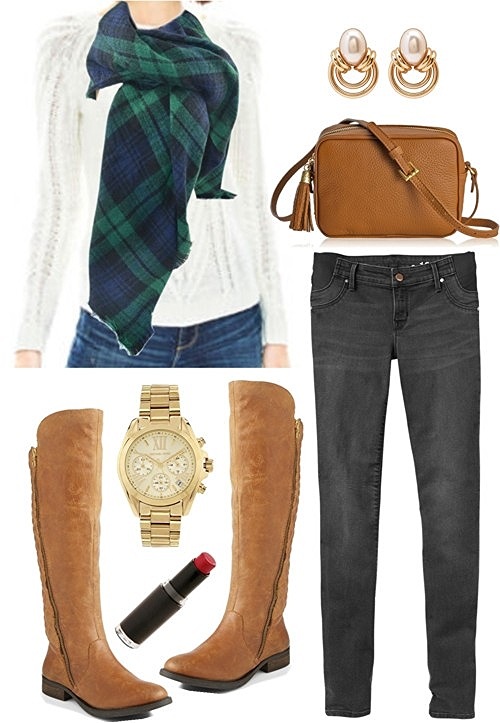 That plaid blanket scarf looks so warm and cozy! I love how it stands out against all the other neutrals in the outfit! And that red lips is just fab!! I love that scarf! it looks so warm and cozy! hope you feel better soon! So sorry to hear you weren't feeling great this weekend, lady! Hopefully you are feeling much better today! I have that same scarf and I love how you styled it! Pairing it with a white sweater really allows it to be the star of the show! $300 to Nordstrom!? um, yes please! I've got that spent already haha! I finally got back to getting some more wet n wild lipsticks, I love the matte formula since they don't feather out, but unfortunately my CVS was out of the stoplight red, after seeing it on you I need to stalk it out. That's awesome that you guys gave extra candy to such a great organization - spreading joy can be so effortless yet so meaningful sometimes :) Thanks for the great giveaway! ❤️❤️❤️❤️❤️ Could totally use a gift card!!!! I love your comfy scarf! I love styled posts but sometimes we just need a break, these posts are great!! 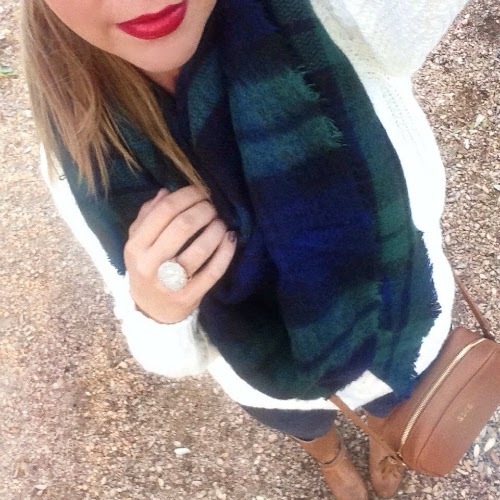 Love that cozy scarf!! Great colors. Thanks for the giveaway!